Our original RTW trip itinerary had us starting in Maui before heading down under to explore New Zealand and Australia. Not only would this have put us in these countries at an ideal time of year, we also thought it would ease us into long-term travel. When our plans changed to include volunteering in Cambodia, we re-routed and decided to spend three weeks in Thailand before we landed in Phnom Penh for three months. 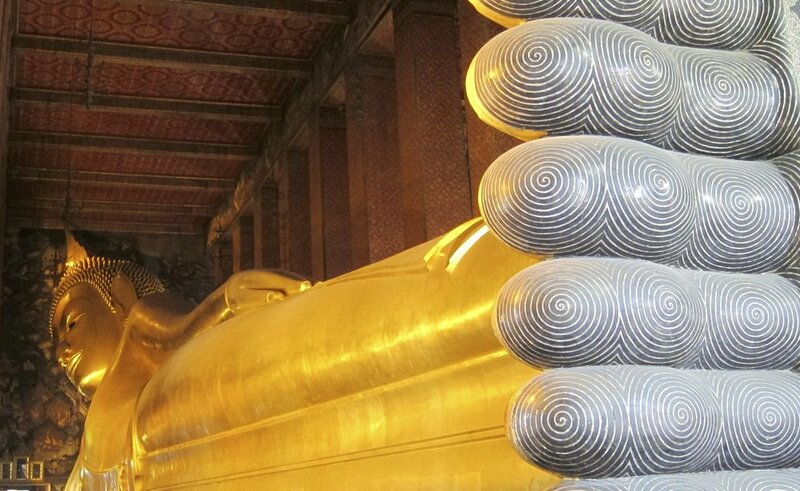 Easing into travel by starting in Bangkok - a sprawling, intense city of 8.6 million people? It didn't seem possible. Strangely enough, Bangkok was the perfect introduction to our new lives. It was entirely different from what we were used to (the city of San Francisco has 815,000 people), but was nowhere near as challenging to navigate as we had imagined. Sure it's chaotic, crowded, hot and we couldn't read or really speak a bit of Thai - but, the people were mostly friendly and welcomed us into our life of travel with open arms. We only had two days to explore the city so our reach was small, but impactful. Mesmerized by a monk chanting in a temple near Wat Arun, awed by the scale of the Reclining Buddha at Wat Pho, seeing the city in lights from a swanky rooftop bar at sunset, spotting little dragons in a city park, proudly finding our way through narrow side streets in search of food and relaxing on our guesthouse patio talking with its friendly owner - Bangkok was an introduction to a world we had never before known and one which we're continuing to discover. Reclining Buddha at Wat Pho - 15m high and 43m long. The Bangkok we saw was a city of stark contrasts. Day 1: We walked a half a mile from our guesthouse to the Central Pier river taxi stop. The path was less than half a sidewalk and we occupied our time dodging all motorized vehicles, weaving between street vendors and in general trying to not be killed by insane taxi cab drivers. When we arrived, the pier was complete tourist mayhem. The "tourist" boat was sucking people into buying a ticket for two and a half times the cost of a round trip ride on the river taxi (50 cents) and people were queuing up for a block to buy them. We eventually made it to the public river taxi line and boarded the long, narrow, open air boat. A woman elbowed her way through the boat at certain intervals, shaking her coin canister and asking people to pay for their ride. The river was brown, polluted and clogged with taxis and long tail boats spewing out exhaust. The river's banks were a mix of high end hotels, shacks and piers. The pier signs were mostly in Thai and we could only tell what stop we were at by the ticket woman yelling the pier number. It was exciting, fun and felt real. Day 2: We decided to take the BTS Skytrain to our destination. We walked 50 yards from our guesthouse up the stairs to the station entrance. I selected "English" from the electronic ticket machine and purchased our two tickets in less time than it took to ask someone where the public taxi line was the day before. We passed coffee and belgian waffle kiosks in the station and took the escalator up to the platform. The train came in a few minutes and the car was sparkling clean, air-conditioned and orderly. We reached our stop in a few minutes and knew when to get off by the announcement in both Thai and English. We followed the signs through the walkways to the exit we needed. It was easy, painless and quite boring. It was almost too much like the life we left behind (only BART isn't that clean). The contrasts didn't stop at public transportation. We noticed it in the price of the street vendor meals versus the high end restaurants that kept appearing in our searches. Storefronts on major streets would be new and fresh, while one street behind, families would be living in shacks surrounded by garbage. A coffee shop's entire menu posted behind the counter was only in English, but no one working in the shop understood or spoke the language. It took actually beginning our trip to understand that easing into travel wasn't what we needed. We needed to be thrown in the chaos to know that we'll be okay. The anticipation of our trip had been steadily building over the past two months and made us more anxious than just living it. Bangkok, we'll be forever grateful for you as our RTW trip jumping off point. We spent an average of $97 a day in Bangkok, not a bad start based on a $125/day budget (we're traveling a bit better than an average backpacker). Our accommodations in Bangkok were at the Littlest Guesthouse. A terrific bargain and quiet oasis in a crazy city.